Coming in many varieties, Euphorbia do require different care depending on type. We look at different varieties and basic care techniques as well as varieties available for sale. 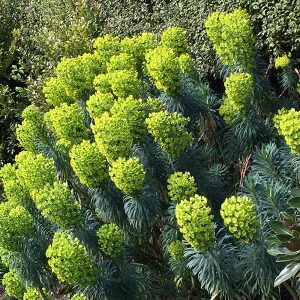 With species grown as indoor plants as well as some excellent garden varieties the genus Euphorbia has a lot to offer gardeners and landscapers alike. Sometime called ‘Spurges’ this useful group of plants offer attractive flowers from late winter to spring depending on the variety as well as the species. This is a very large genus (over 2100 species across the world), the best known is probably the Poinsettia or Euphorbia pulcherrima. From this indoor plant with soft foliage we can move to E. millii more commonly known as crown of thorns, a prickly plant with wonderful flowers, also suited to growing indoors. Popular garden species are long lived and easy care, they look good planted in containers and can also be mass planted in the garden border. 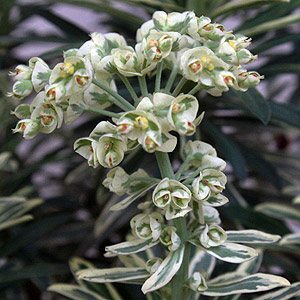 With such diversity in appearance and growth habit, Euphorbia provide gardeners and landscapers with a range of attractive and hardy plants. Suited to both container growing as specimen plants as well as for planting in the cottage garden in general they are easy care and drought tolerant. From low growing species to large tree like specimens all species produce a milk like sap which is generally toxic, we always handle these plants with protective gloves. The species have very different appearance and growth habit and you may well be surprised as to just how diverse the genus is. Some species look more like cactus, others are great foliage plants and can be mass planted in the garden. Use them in front of an evergreen hedge to provide contrast and texture. A wide range of plant forms are available, from annuals and perennials, shrubs to and trees, consequently cultivation requirements vary greatly, so seek specific information when purchasing. In general a well drained soil in an open sunny position, remember the latex like sap of all euphorbia is poisonous so be careful when handling. A position in full sun is best. A well drained soil is essential for most species. Some moisture during long dry periods will be needed for most species. Fertiliser requirement is low for most varieties. Pruning will depend on variety. Some benefit from regular pruning, others require little to no pruning at all. In containers, a well drained potting mix is essential for all. The sap that they exude makes them almost pest free, so these hardy plants make an excellent choice for many garden situations. Temperature tolerance are perhaps the most telling, some do not cope well in any area with cold wet winters, others do not seem to mind. Poinsettia E. pulcherrima and in its natural habitat can reach 4m. E. milii (crown of thorns) can reach 2m, but remember that hybrid varieties are generally smaller growing. E. myrsinites is know as ‘donkey tail spurge’. E. supina or ‘creeping spurge’ is regarded as weed by many. Euphorbia plants are available for sale from the following participating nurseries.